On April 27, a group of FAR Mathevosian Scholarship Program students from Gyumri, gathered together to clean FAR Gyumri Nishan and Margrit Atinizian Senior Center* and the surrounding areas. The results of the hard work that day came as a nice surprise to the elderly beneficiaries when they came in for their daily nutritious hot meal. And students, too, were happy. 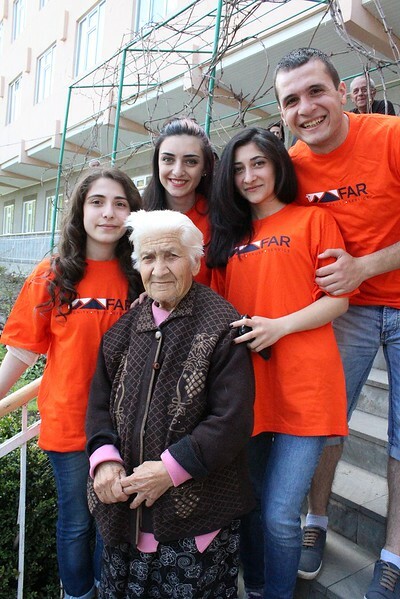 Another spring cleaning party took place at FAR’s Vanadzor Old Age Home (VOAH)* on May 13. About 50 students and recipients of FAR Scholarships gathered around the idea to spread happiness among the grandmas and grandpas by cleaning and tidying up VOAH. The celebration started on the bus from Yerevan as the students sang upbeat songs together and reached its peak at VOAH. There were songs, dances, games, and socializing with the elders – all part of a well-established tradition of giving back during our yearly spring cleaning visits. Upon arrival, the students divided up the responsibilities between three groups. One group cleaned the building, another did the garden, and the third group – our Gulamerian Scholarship* students from Vanadzor Orphanage – provided beauty services to VOAH residents. “Everyone was in high spirits,” remarks FAR Education and Science Program Manager Edik Karapetyan. “Most of our students who were at VOAH for the first time were impressed by the warm atmosphere and the positive energy coming from the residents. They shared their daily life experience with the students, who in their turn talked about university life and studies. Together they – the students and the residents, played chess and backgammon”. In the heat of the spring cleaning party, Yerevan State Conservatory students jumped in with their beautiful folk songs and invited the students and VOAH residents to dance. The day ended with delivering special sweets and pastries for the residents. Moreover, Alexander Nersisyan, a VOAH resident and avid painter received a special gift from the students – painting supplies to further his love for depicting landscapes and portraits. *The Vanadzor Old Age Home (VOAH) is a FAR project sponsored by Gevorg and Sirvard Karamanuk Foundation and supported by the Women’s Guild Central Council of the Eastern Diocese (WGCC). *The Gulamerian Vocational Training and Education Program is a FAR Program sponsored by the Harold and Josephine Gulamerian Foundation.